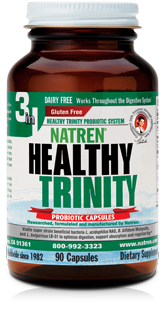 Natren Healthy Trinity probiotic supplement is a gluten-free, dairy-free, soy-free supplement with three probiotic strains in it. It is listed as Natren’s most potent and most popular product and contains a minimum of 30 billion CFU per capsule. 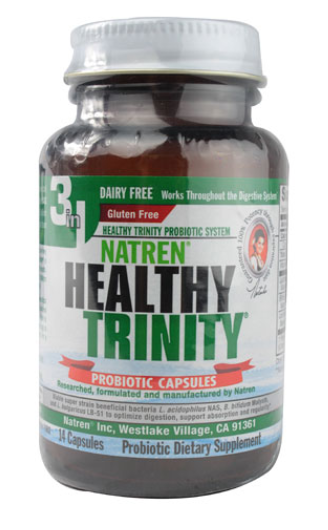 What Probiotic Strains are in Natren Healthy Trinity? Lactobacillus acidophilus NAS - For more information about this strain, click on the strain name. Bifidobacterium bifidum Malyoth - This strain has research on it dating back to 1950 and 1953, but the papers are written in German and Google translate did not work well, so unfortunately, I cannot read them. Lactobacillus bulgaricus LB-51 - For more information about this strain, click on the strain name. What Studies with the Product Have Been Conducted? Two studies that I am aware of used Healthy Trinity as a whole. In one study, it was used along with an intravaginal probiotic for relief from candidiasis which is discussed on this page. In another study it was used either as a stand-alone treatment for acne in women or as an adjunct therapy to minocycline. See this page for that information. 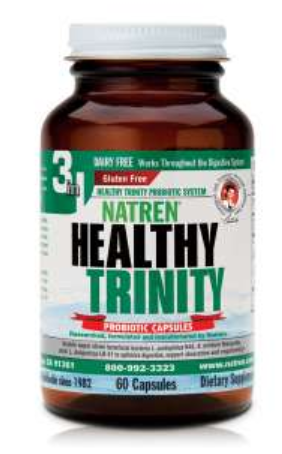 What are the Other Ingredients in Natren Healthy Trinity? The other ingredients at the time of this writing (May, 2015) are minimal and include sunflower oil, gelatin (Beef allergy alert!) and mixed tocopherols. None of the ingredients are GMO (genetically-modified organisms) according to the company. The mixed tocopherols are components of vitamin E that protect the oil against spoilage. Please verify ingredients of any supplement prior to taking it. Natren’s exclusive technology coats each strain of bacteria in a sunflower-oil matrix system within a two-piece hard gel capsule that is banded and sealed with gelatin which is stated to keep them separated, noncompetitive and nearly completely protected from the low pH of stomach acids. When the strains reach the small intestine, bile is supposed to break down the oil matrix, freeing the bacteria to spread out in the intestines. What is the Recommended Dosage of Healthy Trinity? The recommended dosage of this product is 1 capsule orally per day. What are the Pros of Natren Healthy Trinity? The exact strains are listed. The amount of each strain is listed. The strains are separated from each other to limit any possible competitiveness. Compared to other multi-species probiotic supplements, this one contains a higher number of total CFU of 30 billion per capsule. It is packaged in an amber glass bottle. It is marketed for support of digestive health, occasional gas, regularity, digestion of dairy products with lactose metabolism, digestion of carbs and proteins and production of B vitamins. Based on the individual strains in the product, all of those claims can reasonably be expected. Potency is guaranteed through expiration date when stored as directed. Natasha Trenev and her company, Natren, only produce probiotic products and only use lactic acid probiotic strains which are used in fermented foods. Natren produces it probiotics supplements in its own pharmaceutical-grade facility is in California, USA, and it has received international Good Manufacturing Practice certification. Third-party verification: The survivability in bile is independently third-party tested in vitro by Silliker Laboratories. Clinical studies: This supplement as a whole supplement has peer-reviewed, published research done with it, which is very unusual. Very few multi-species probiotic supplements are used in studies. Instead, species and strain that are show to be effective and non-competing are mixed together in most multi-species supplements such as this one. What are the Cons of Natren Healthy Trinity? There is not a vegetarian option. There is no mention of third-party verification of the finished product to insure that the product is as pure as possible. Where to Find Natren Healthy Trinity? Unlike many manufacturers, Natren only produces probiotics and their manufacturing practices are certified by a third-party international agency. They produce their probiotics in a pharmaceutical-grade facility and do their own culture maintenance, oil-encapsulation and freeze-drying process. Every step of the way is performed under continuous refrigeration to ensure maximum product life. The products are bottled in dark amber-glass with tin lids to prevent moisture and light from harming the products. When you buy in the US directly from Natren via my links, they always ship their probiotics with 2-day air shipping with blue ice and both blue ice and dry ice during hot summer months in specially-designed, thermally-controlled boxes to protect the potency. Natren does everything it can to guarantee that your probiotics will perform at their optimum levels through the expiration date on the label. 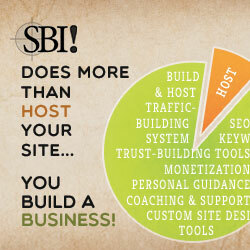 That is why the links below will take you to the Natren website. Another option for purchase nearly worldwide, Vitacost, is also listed below. Vitacost stores this product in the refrigerated section of their warehouse and will ship refrigerated probiotics with a cold pack. They recommend that you choose 1- or 2-day shipping. They may or may not ship internationally. To order from Natren, click here or on the picture to the right. Natren sells a value size of 90 capsules. Is Natren Healthy Trinity the Right Supplement for You? Only you can decide if this probiotic supplement is right for you. It is a high potency supplement, has "safe" species of Lactobacillus and Bifidobacterium, has a nice delivery system, is free of most allergens and is packaged securely. Thanks to Carole for suggesting a review of this supplement!